In three previous blog posts, I detailed how Overstock.com (NASDAQ: OSTK) violated Generally Accepted Accounting Principles (GAAP) and SEC disclosure rules by improperly deferring the recognition of an accounting error to create a cookie jar reserve to inflate future profits. On October 24, 2008, Overstock.com revealed that it underbilled fulfillment partners in periods prior to Q3 2008 because of customer refund and credit errors. The company improperly chose to recognize future recoveries from underbilling its fulfillment partners on a cash basis (non-GAAP) rather than restating previously issued financial reports to correct the material accounting error (GAAP). Note: Details of my previous blog posts here, here, and here). 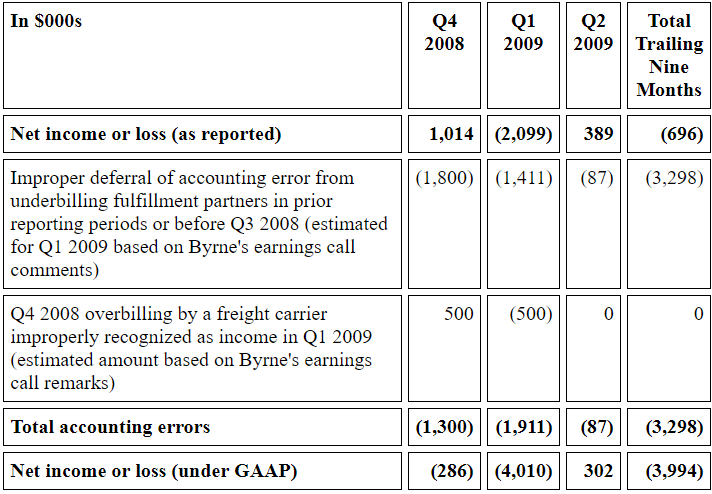 More recently, I provided Overstock.com with a series of questions to answer about its accounting errors during its Q2 2009 earnings call (Details here). Rather than answer each of my questions, CEO Patrick Byrne went on a ranting diatribe as described by investigative journalist Gary Weiss in his blog (Details here). The reason for avoiding any meaningful discussion of Overstock.com’s questionable financial disclosures is clear. Overstock.com and Patrick Byrne are desperately trying to avoid restating the company’s financial reports due to accounting errors for the third time in three years. I will come back to this point later in this blog post. However, first let’s examine Overstock.com’s consistent pattern of financial reporting irregularities and lies by management to investors. Since, its inception in 1999, Overstock.com is has yet to produce a financial report that has not at least initially violated GAAP and SEC disclosure rules. In fact, certain financial reports from 2003 to 2005 were restated twice to correct accounting errors. From December 2000 to March 2002, Patrick Byrne lied about Overstock.com’s financial performance in a series of interviews on national television and in various publications prior to the company’s initial public offering in March 2002. 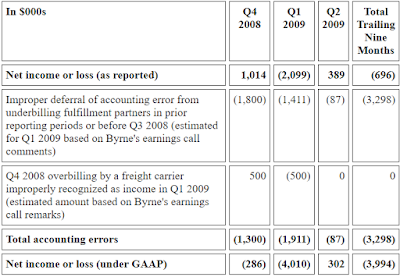 Patrick Byrne deceptively used pro forma non-GAAP “gross value merchandise value sales” (instead of the lower GAAP commission revenue) to hype the company’s top-line performance in order to falsely claim that Overstock.com was profitable, when it never was profitable (Details here). "…I think “EBITDA” is the stupidest thing I ever heard emanate from Wall Street (no small feat)...."
Over the next few years, it became clear that Overstock.com never issued a financial report for any quarterly reporting period that initially conformed to GAAP or SEC disclosure rules, despite Byrne's April 2004 claim that he was "all about GAAP." Overstock.com even resorted to reporting a non-compliant EBITDA that violated SEC rules. As I will demonstrate below, Overstock.com did not comply with both GAAP and allowable non-GAAP financial measures (such as EBITDA) under SEC rules. In other words, investors are cautioned to be skeptical of any disclosure coming from Overstock.com and its management team led by corporate miscreant Patrick Byrne. In February 2006, Overstock.com restated financial reports dating from 2002 to 2005 due to inventory accounting errors. Only because of Overstock.com's inventory build up at that time, the timing of Overstock.com's inventory accounting error disclosure enabled Patrick Byrne to boast that the company's numbers were too conservative. However, Overstock.com's later restatement of financial reports announced in October 2008 wiped out previous positive adjustments to income from correcting its inventory accounting error by a factor of three. In Q4 2006, Overstock.com took advantage of record losses and inflated inventory reserves. Former company President Jason C. Lindsey told investors that, "we used the fourth quarter to get rid of all the slow-moving inventory. I am quite pleased with the inventory balances we have now. ...I am pleased that the fourth quarter is now over. We have sold it." However, Overstock.com later disclosed that inventory reserves had actually increased in both relative and absolute amounts. If Overstock.com had actually sold "all the slow-moving inventory as claimed by Lindsey, there is no way that inventory reserves can increase in both absolute and relative terms. The company overstated its inventory reserves to create a cookie jar reserve so it could increase profits in fiscal year 2007 (Details here). From Q2 2007 to Q2 2008, Overstock.com violated SEC Regulation G by reporting a non-compliant “Earnings before interest, taxes, depreciation and amortization” or EBITDA to materially overstate its financial performance. As I detailed above, Patrick Byrne had previously claimed that "I don’t believe in EBITDA. If somebody talks EBITDA, put your hand on your wallet; they’re a crook." 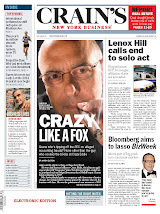 He said that “EBITDA is the stupidest thing I ever heard emanate from Wall Street." Therefore, Patrick Byrne is "stupid" and a "crook" by his own definition, since Overstock.com used a non-compliant EBITDA to materially overstate its financial performance in violation of SEC Regulation G.
Despite Byrne's prior statements, Overstock.com improperly reconciled its non-compliant EBITDA to operating income rather than net income and improperly excluded stock-based compensation costs from its non-compliant EBITDA measure. When pressed by me to discuss Overstock.com's non-compliant EBITDA disclosures, CEO Patrick Byrne, company President Jonathan E. Johnson, former CFO David Chidester, now demoted by the company, lied to investors in a conference call about Overstock.com’s compliance with SEC Regulation G (Details here). Lee Webb from Stockwatch chronicled my year long battle with Overstock.com to successfully force the company to comply with SEC Regulation G for certain non-GAAP financial disclosures and my ongoing battle to force the company to comply with GAAP and SEC rules in reporting certain accounting errors (Details here). In January 2008, former company President Jason C. Lindsey backdated his resignation (Details here). In January 2008, the Securities and Exchange Commission discovered that Overstock.com's revenue accounting failed to comply with GAAP and SEC disclosure rules, from the company's inception (Details here). This blog detailed how the company improperly provided the SEC with a flawed and misleading materiality analysis to convince regulators that its revenue accounting error was not material to avoid restating its financial reports (Details here). In April 2008, Company President Jonathan E. Johnson lied to Wired.com about Overstock.com’s GAAP compliance in reporting revenues. 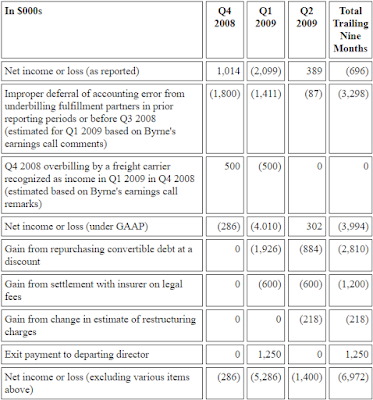 In a financial report, Overstock.com compared Q1 2008 GAAP revenues to non-GAAP Q1 2007 revenues. At that time Overstock.com failed to restate Q1 2007 revenues to correct material revenue accounting errors uncovered by the SEC (Details here). Shortly afterwards, Johnson sold almost $1 million in stock (Details here). The next month, now demoted CFO David Chidester cashed out about $77,000 from selling his Overstock.com shares. Several months later, Overstock.com had to restate Q1 2007 revenues. On October 24, 2008, Overstock.com disclosed new customer refund and credit errors and it company warned investors that all previous financial reports issued from 2003 to Q2 2008 “should no longer be relied upon.” This time, Overstock.com restated all financial reports dating back to 2003. In addition, Overstock.com reversed its one-time cumulative adjustment in Q4 2007 used to correct its revenue accounting errors and also restated all financial statements to correct those errors, as I previously recommended. 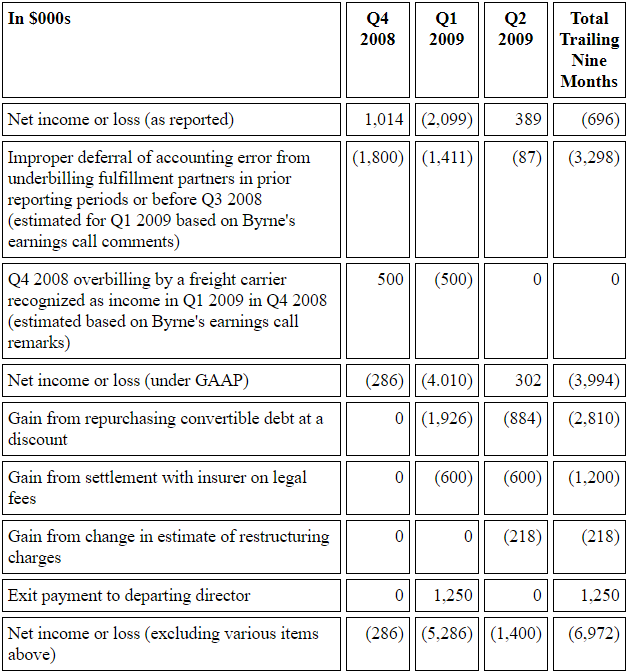 The company reported that the combined amount of revenue accounting errors (previously uncovered by the SEC) and newly disclosed customer refund and credit accounting errors resulted in a cumulative reduction in previously reported revenues of $12.9 million and an increase in previously reported accumulated losses of $10.3 million. Since Overstock.com had previously reported an increase in accumulated losses from its revenue accounting error of $2.1 million (see above), its new customer refund and credit errors resulted in an additional $8.2 million in accumulated losses in prior reporting periods. It was the second time in three years that Overstock.com had to restate its financial reports and the company filed amended reports with the SEC. In addition, Overstock.com corrected its non-compliant EBITDA measure (as described above) in those amended financial reports. However, the explanatory note to those amended financial reports filed with the SEC, Overstock.com only made reference to corrections of its revenue accounting errors customer refund and credit errors, but made no reference to correcting its non-compliant EBITDA to comply with SEC Regulation G.
As I will detail below, Overstock.com’s additional accumulated losses of $8.2 million in prior reporting periods from its customer refund and credit errors were improperly overstated by at least $3.0 million dollars to create a cookie jar reserve to inflate future earnings. In its restatement of prior period financial reports, Overstock.com failed to include accruals of income for amounts due to the company from underbilling its fulfillment partners for offsetting costs and reimbursements, less a reasonable estimate of uncollectible amounts, as required by GAAP. Instead, Overstock.com improperly recognized over $3 million of such underbilling recoveries over three future quarters (Q4 2008, Q1 2009 and Q2 2009) as income on a cash basis. As a result, Overstock.com improperly deferred recognition of an accounting error over future periods and materially inflated income during those periods. In effect, Overstock.com wrongfully corrected an accounting error over two or more periods by using a cookie jar reserve. The correction of error, including erroneous estimates related to loss contingencies, should be disclosed in the period in which the error is discovered. The correction is accounted for and reported as a prior period adjustment, that is, by restating the financial statements of the affected prior periods. See FAS 16, Prior Period Adjustments (June 1977) [as partially superseded by FAS 109, Accounting For Income Taxes (February 1992) ¶288(n)]; APB 20, ¶¶13, 36 and 37; and APB 9, Reporting the Results of Operations (December 1966) ¶¶18 and 26. 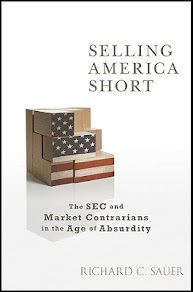 As the SEC makes clear, “GAAP do not allow for the deferral of accounting adjustments arising from a change in estimate or the correction of error” and “Correction of error may not be accounted for prospectively, or over two or more periods, in order to diminish the effect of the correction on any one period.” However, Overstock.com prospectively corrected its accounting errors from underbilling fulfillment partners over three periods and violated GAAP and SEC rules. After my original blog post exposed Overstock.com’s latest financial reporting violations, the company is desperately trying to avoid a third restatement of its financial reports due to the improper deferral of income from recovering offsetting cost reimbursements and fees against its customer refund and credit errors from its fulfillment partners. On January 30, 2009, Overstock.com reported a net profit of $1 million profit and $.04 earnings per share for Q4 2008, after 15 consecutive quarterly losses and it beat mean analysts’ consensus expectations of negative $0.04 earnings per share. CEO Patrick Byrne gloated to investors, "After a tough three years, returning to GAAP profitability is a relief." As I detailed above, Overstock.com already disclosed in an October 24, 2008 press release that it failed to bill its fulfillment partners for offsetting cost reimbursements and fees resulting from its customer refund and credit errors. The company claimed to have already corrected those errors by restating all financial reports issued prior to Q3 2008 and it increased accumulated losses by $10.3 million. As it turned out, Overstock.com improperly failed to include in its restatement of previously issued financial reports an accrual of amounts due the company from underbilling its fulfillment partners for offsetting costs and reimbursements, less a reasonable estimate of uncollectible amounts. After the earnings call, I wrote blog post explaining that if Overstock.com properly followed accounting rules, it would have reported an $800,000 loss instead of a $1 million profit, it would have reported sixteen consecutive losses instead of 15 consecutive losses, and it would have failed to meet mean analysts’ consensus expectation for earnings per share (anyone of three materiality yardsticks under SEC Staff Accounting Bulletin No. 99 that would have triggered a restatement of prior year’s effected financial reports). Antar's ramblings are gibberish. Show them to any accountant and they will confirm. He has no clue what he is talking about. … Overstock.com recognized the "one-time of $1.8 million" using cash-basis accounting when it "received payments from partners who were under-billed earlier in the year" instead of accrual basis accounting, which requires income to be recognized when earned. A public company is not permitted to correct any accounting error using cash-basis accounting. However, the SEC’s position is that you cannot abuse “conservatism” to “understate net assets and profits” or by overstating a loss from an accounting error to create a cookie jar reserve to increase income in future reporting periods. However, that's exactly what Overstock.com did. After Patrick Byrne’s chat board remarks confirming improper cash basis accounting, Overstock.com concocted a new excuse to justify Patrick Byrne’s stock market chat board ramblings. In Q1 2009, we reduced total cost of goods sold by $1.9 million for recoveries from partners who were underbilled in 2008 for certain fees and charges that they were contractually obligated to pay and a refund due of overbillings by a freight carrier for charges from Q4 2008. …we did get the benefit of a shipping billing benefit of some several hundred thousand dollars and so forth. First question is when the under-billing was originally discovered, we determined that the recovery of such amounts was not assured and consequently the potential recovery constituted a gain contingency. That's correct, as we unraveled in the fourth quarter last year, and so Sam then asks a whole bunch of questions about this. According to claims in Overstock.com’s financial disclosures to the SEC and Byrne’s comments during the Q2 2009 earnings call, the decision to consider future recoveries from underbilling fulfillment partners as a "gain contingency" was made at the time the underbilling error was discovered. If that is really true, the date such discovery had to have been much earlier than October 20, 2008, the date that the Board of Directors approved the company's restatement of previously issued financial reports to correct customer refund and credit errors (Source: 8-K report page 5). However, auditing and SEC rules require that a company take into account material events affecting the measurement or realization of assets in a financial report up to the date that either the final 10-Q report or 10-K report is filed with the commission (See: SAS No. 1 Paragraph 1, 2, 3, and 7 and Letter from SEC Chief Accountant entitled "Audit Risk"). In other words, if new information is received after the cut-off date that affects either assets or income in a financial report, a company must adjust its financial report to reflect that new information. If Overstock.com's explanation of a gain contingency is to be believed, the company improperly determined that a gain contingency existed when it first discovered underbilling its fulfillment partners, instead of spending any time trying to determine the recoverability of such underbilled amounts. Overstock.com should have waited at least until November 7, 2008 (or 38 days into the fourth quarter) when it filed its Q3 2008 10-Q report before making a final determination as to the collectibility of underbilled amounts due from fulfillment partners as of the end of Q3 2008. In fact, the company could have waited an additional seven days to determine the collectibility of underbilled amounts due from fulfillment partners and still filed its 10-Q report on time. If management truly wanted to make a reasonable estimate as to the collectibility of underbilled amounts due from fulfillment partners, Overstock.com could have properly filed a late 10-Q report by explaining the circumstances. It didn't. Apparently, management deliberately tried to avoid restating its financial reports for a third time in three years. In any case, no gain contingency existed at all and Overstock.com collected $1.8 million in underbilled amounts from its fulfillment partners during Q4 2008. Since Overstock.com filed its Q3 2008 10-Q report 38 days into the fourth quarter, management had to know that large amounts due from underbilling its fulfillment partners were in fact collectible. Therefore, Overstock.com cannot claim that "we determined that the recovery of such amounts was not assured, and that consequently the potential recoveries constituted a gain contingency". In fact, the recovery of large amounts of previously underbilled amounts was "assured" since the company quickly recovered $1.8 million in Q4 2008. Overstock.com had already earned those "fees and charges" in prior periods from fulfillment partners. It simply underbilled them. Those fulfillment partners were already "contractually obligated to pay" such underbilled amounts. In addition, there was no question that Overstock.com was owed money from its fulfillment partners and that the recovery of substantial amounts was assured. Therefore, no gain contingency existed under accounting rules. If there was any question as to the recovery of any amounts owed the company, management is required to make a reasonable estimate of uncollectible amounts (loss contingency) and book an appropriate reserve against amounts due from fulfillment partners. By immediately considering underbilled amounts due from fulfillment partners as a gain contingency, the company failed to make a reasonable estimate of such uncollectible amounts and violated accounting rules or GAAP (See SFAS No. 5 paragraph 1, 2, 8, 22, and 23). Statement of Financial Accounting Standards No. 154 requires Overstock.com to restate affected prior period financial reports to reflect when the underbilled cost reimbursements and fees were actually earned by the company (accrual basis or GAAP). Statement of Financial Accounting Standards No.5 requires Overstock.com to offset such accrued income in each restated financial period with a reasonable estimate of uncollectible underbilled amounts. Therefore, Overstock.com overstated its customer refund and credit accounting error by failing restate its prior affected financial reports and accrue underbilled amounts due from its fulfillment partners as income in the appropriate accounting periods, less a reasonable reserve for unrecoverable amounts. By improperly deferring recognition of income until underbilled amounts were collected, the company used non-GAAP cash basis accounting to effectively create a "cookie jar" reserve to increase future earnings. In addition, Overstock.com improperly failed to disclose any potential “gain contingency” in its Q3 2008 10-Q report, when it disclosed that it underbilled its fulfillment partners (See SFAS No. 5 Paragraph 17b). Was management's claimed "gain contingency" a backdated made up attempt to cover up the company's improper treatment of an accounting error? The "gain contingency" disclosure only appeared in Overstock.com's fiscal year 2008 10-K after I criticized its improper treatment of the underbilling error in my blog. The only way that Overstock.com could recognize income from underbilling its fulfillment partners in future accounting periods is if there was a “significant uncertainty as to collection” of all underbilled amounts (See SFAS No. 5 paragraph 23). As it turns out, a large portion of the underbilled amounts to fulfillment partners was easily recoverable within a very brief period of time. Therefore, no “significant uncertainty as to collection” existed. During Q4 2008, Overstock.com collected a total of “$1.8 million relating to payments from partners who were underbilled earlier in the year.” Overstock.com filed its Q3 2008 10-Q report 38 days into that quarter and clearly should have known by that time that significant amounts owed by fulfillment partners from underbilling them in the past was actually collectible and that no gain contingency existed as to such amounts. On February 23, 2009, Overstock.com filed its annual audited 10-K report with the SEC. By that time, Overstock.com clearly knew that $1.8 million in underbilled amounts due from fulfillment partners was collected by December 31, 2008. In addition, Overstock.com collected over $1.5 million in underbilled amounts during Q1 2009. Since Overstock.com issued its 10-K report 54 days into Q1 2009, the auditors should have known that no gain contingency existed for underbilled amounts due from fulfillment partners. Overstock.com "dismissed" PricewaterhouseCoopers as its auditors and replaced them with Grant Thornton, shortly thereafter. Taking advantage of convertible debt holders and other one-time items aid Overstock.com's financial performance. In November 2004, Overstock.com raised new cash through the issuance of convertible debt securities. Since that offering, Overstock.com restated its financial reports from 2003 to 2004 two times. In other words, Overstock.com's convertible debt holders relied on financial reports that violated GAAP and SEC disclosure rules. In Q1 2009, and Q2 2009, Overstock.com reported gains of $1.926 million and $0.884 million respectively from buying back such debt at a discount to its face value, thereby taking advantage of those investors who relied on financial reports that violated GAAP and SEC rules. In Q1 and Q2 2009, Overstock.com benefited from the reimbursement of legal fees due to an insurance settlement in the amount of $0.6 million each quarter. In Q1 2009, Overstock.com made a one-time exit payment departing director James. V. Joyce. As the above chart demonstrates, Overstock.com only reported profits in Q4 2008 and Q2 2009 due to GAAP violations, buying back debt issued under false pretenses at a profit, and other one-time benefits. Overstock.com has never reported a profitable year during its entire existence and has accumulated losses of over $266 million. The company has a negative net worth of $4 million. This is a great post. You really put a ton of work into this and it was a great read. Too bad law enforcement will never do anything about any of his huh? I'll have to highlight this post on my blog. Keep up the good work!